The obituary notice of Dr Robert Wallace in the Scots Magazine for July 1771 includes a short account of the Rankenian Club, one of the earliest of the literary societies of eighteenth-century Scotland. The Club took its name from the Edinburgh inn where the meetings of the club were held. David Hume was a member of the Rankenian Club, which may have exercised considerable influence in directing his thoughts towards the new philosophy emanating from Locke and Berkeley, and in making him aware of the necessity for care in literary composition. Other members included Principal William Wishart of Edinburgh University, John Stevenson, Professor of Logic at Edinburgh, and George Turnbull, Professor of Moral Philosophy at Marischal College, Aberdeen. MEDICAL essays and observations, revised and published by a Society in Edinburgh. The first Edinburgh Medical Society was founded in 1731, 'for the improvement of medical knowledge', with Dr Alexander Monro Primus, Professor of Anatomy at Edinburgh, as secretary and editor of the Medical essays. These essays were well received in both Britain and the Continent and helped to spread throughout Europe the fame of the Edinburgh Medical School in the eighteenth century. ESSAYS and observations, physical and literary, read before a Society in Edinburgh and published by them. The Edinburgh Medical Society widened its scope to include philosophy and literature and became the Philosophical Society. Its activities were temporarily suspended by the '45 Rebellion and by the death of Colin Maclaurin the mathematician, but it was reorganised in 1751, with Alexander Monro Secundus and David Hume as joint secretaries and editors of the Essays and observations, which contain papers on almost every subject of science, philosophy and literature. 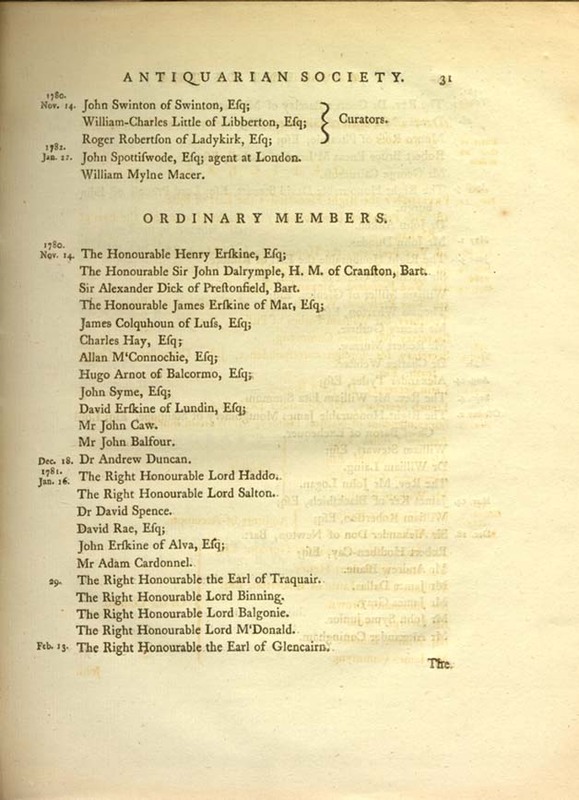 The activities of this society paved the way for the foundation of the Royal Society of Edinburgh, 1783. SMELLIE, William. Account of the institution and progress of the Society of the Antiquaries of Scotland. Founded in 1780, this was the first Society in Scotland to be granted a Royal Charter, although not without opposition. Andrew Dalziel, Professor of Greek at Edinburgh, wrote: 'Lord Buchan is kicking up a sad dust about his Antiquarian Society. 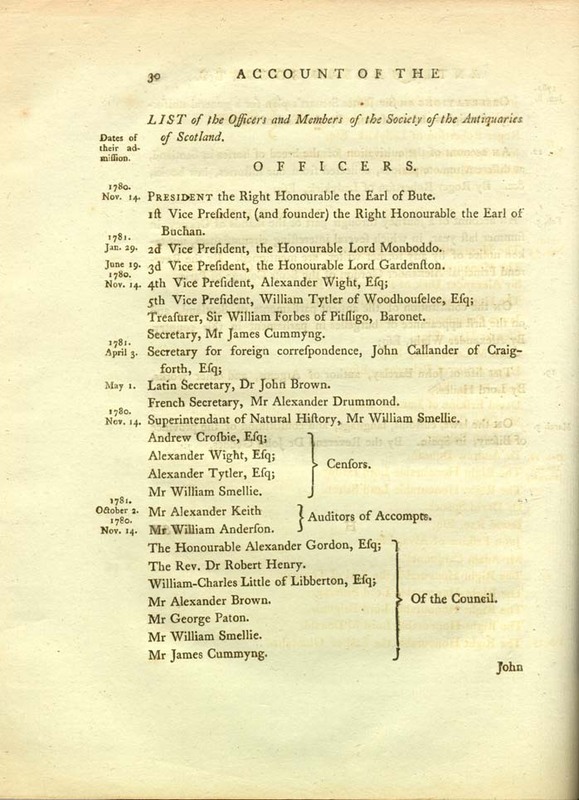 He has admitted such a number of ragamuffins that the respectable members are resigning very fast, and joining the University and Faculty of Advocates in an application for a Royal Charter for a new Society.' This new society was the Royal Society of Edinburgh. The topics for debate include: Is a standing army, or a militia, preferable? Should the liberty of the Press be restricted? Would a union between Great Britain and Ireland be advantageous to both kingdoms? Are representatives in the British Parliament bound to obey the instructions of their constituents? The Society was established in January, 1752, and was based upon the College of Glasgow, although it did include amongst its members several leading merchants, not to mention Robert and Andrew Foulis the printers. More wide-ranging than the average literary society, its meetings heard the stirrings of Adam Smith's ideas on language, moral sentiments and the wealth of nations, and Joseph Black's theories on heat, which were to influence his 'star pupil', James Watt, the inventor of the steam engine. GLASGOW CONSTITUTIONAL ASSOCIATION. A collection of publications, selected by the Committee of the Glasgow Constitutional Association, and recommended by them to the public. This volume contains a number of declarations and addresses which were designed to prevent the spread of sympathy for the French Revolution.